← Four Healthy and Natural Ways To Boost Energy! Need a better inspiration to work out? 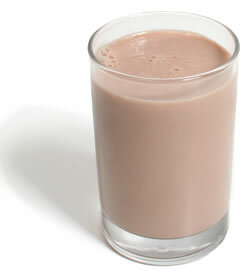 How about rewarding yourself with a favorite childhood treat: Chocolate milk? You read that right. Recent studies have shown low-fat chocolate milk provides a better carbohydrate/protein ratio than other sports drinks, proving to be a more beneficial post workout recovery drink! For those not big on the muscle building aspects of exercise, you may be asking, “So what? What’s so important about a good ratio between carbohydrates and protein?” It’s a great question that we will tackle in this post while describing the benefits of chugging chocolate milk post workout. In the past, there has been a common misconception that protein is the only factor in repairing muscles after a hard work out. There’s been a plethora of protein bars and shakes to further support the theory, but protein alone can’t accomplish everything your body’s muscles need to recover and grow. It’s important to understand the synergistic effect of both carbohydrates and protein, (which are both found in chocolate milk), when it comes to muscle repair and energy. While protein builds the muscles, carbohydrates supply the energy for the repair necessary post workout. In order to understand the relationship between the two macronutrients, we’ll break them both down in terms of exercise and muscle building. It’s a well-known fact that protein is the only macronutrient directly responsible for the building of muscle tissue, which is probably what makes it so popular in the body-building world. Protein is broken down into amino acids, or “the building blocks of muscle tissue.” When you work your muscles as hard as you do in a workout, the tissues are essentially damaged and the structural proteins are broken down. Those muscles, then preparing themselves for another similar workout, need new proteins broken down into amino acids to rebuild themselves stronger. The stronger they build themselves, the more prepared they are for another workout of similar intensity so the less damaged they become. The result: bigger muscles and increased strength. As most of us know, carbohydrates are broken down into two categories: simple carbohydrates and complex carbohydrates. Most of us also know that when choosing our carbohydrates, it’s best to go with the complex carbs. Here, however, is what most of us don’t know: when it comes to working out, you should consume both simple and complex carbohydrates depending on which stage of the workout you are in. Simple Carbohydrates = after workout. Now before you go nosh on a candy bar or other high fructose corn syrup treat after a circuit in the gym, let me explain. -They provide the body with the most energy. Carbohydrates are stored in your muscles and liver and converted to ATP (Adenosine triphosphate), or energy, as the body needs it. Without consuming the right amount and type of complex carbohydrates, your body won’t have the proper energy to perform at peak condition throughout the entire workout. Think of it like your morning coffee. If you’ve been religiously drinking coffee every morning, you can get through your day without it, but you’ll feel weak and as if you can’t perform to the best of your ability like you could have if you’d of had your coffee. With it however, you feel energized and ready to take on the world. The same goes for your body’s need for complex carbohydrates and energy. While you could technically get through your workout routine without the proper amount of complex carbohydrates, it would be less efficient and quite the struggle. Overall, I don’t recommend attempting it. These carbohydrates are best to get in the morning with your breakfast, which I know you aren’t skipping! Check out the post Four Natural and Healthy Ways to Boost Energy for more on complex carbohydrates and breakfast. -Since working out essentially breaks down your muscles, they must be repaired and built back up with the proper nutrients. This repair can happen more quickly with an insulin spike. Insulin is a pancreatic hormone essential for the metabolism of carbohydrates and the regulation of blood glucose levels. Before you go back and read that last line again, let me try and rephrase it here. When we consume high levels of glucose (sugar) as found in simple carbohydrates, our blood sugar level rises, which can become toxic. To prevent this toxic poisoning, our body tells the pancreas to release insulin. The insulin in turn spreads the glucose and other nutrients through the blood stream to our organs, cells, and muscles. This process gives our muscles the quick acting energy source necessary to repair themselves after a hard workout. So, knowing all of this, why is it that chocolate milk is better post workout than other sports drinks? Well, for starters, chocolate milk is a way to “kill two birds with one stone” so to speak. Not only does it contain carbohydrates, but also protein, a macronutrient most other sports drinks don’t contain. Aside from these two beneficial nutrients, chocolate milk also contains a lot of other beneficial things. –Water: Low-fat chocolate milk contains 90% water. This means that while the body is stocking up on muscles building and repairing macronutrients, it is also simultaneously replenishing the fluid lost from sweating. –Minerals: Low-fat chocolate milk, being that it is milk, also contains calcium, which we know is essential for bone formation and maintenance as well as preventing an array of diseases and health issues such as bowel cancer. osteoporosis, and blood clotting. It also contains potassium as well as magnesium. –Vitamins: Low-fat chocolate milk also contains a sufficient amount of vitamins such as Vitamin A, B, D, and E to help with things such as vision, energy function, balancing our calcium level, and protecting us against skin cancer. So next time you are having trouble finding the motivation to go to the gym, use the same method your mother did to bribe you when you were young. “If you do this or that, I’ll give you chocolate milk!” It’s a sweet drink that satisfies many cravings as well as health benefits with none of the guilt! Well, none of the guilt if used properly. The key to using it effectively is assessing your workout and drinking the sweet treat only when necessary. Remember, chocolate milk has simple carbohydrates, or sugar, which can be damaging to a weight loss plan if your body doesn’t need that sugar to quickly rebuild muscles after a workout. In other words, these studies don’t give you the go ahead to guzzling chocolate milk on the regular. Use it in moderation, as you would any other post strenuous workout protein shake. Some “strenuous” workouts include ones that will exhaust your muscles, such as strength training, weight lifting, endurance running, and other heart pumping, calorie scorching workouts. This entry was posted in Fitness/Workouts and tagged carbohydrates, carbs, chocolate, exercise, fitness, milk, protein, strength, training, workout. Bookmark the permalink.